This is a campaign I started a little over a month ago. And yes, I happened to take the initiative, but the fact that the name wasn’t very well chosen was something many people had been thinking about before. Basically, it’s this Danish company that’s taking over a piece of property that had belonged to the army previously and builds a Danish school on it for 70 million Euros, and everybody gets all excited about how great they are. The problem is just that the company doing it is the shipping giant MAERSK and it’s named after their founder Arnold Peter Møller, who died in the 1960s. Now this guy and this company happen to have a history on earning their money on wars (selling arms to the Nazis and earning high profits on services to the Pentagon in connection with the Iraq war) and using union busting tactics against their workers. The A.P.Møller-school of today might be the Gilberto-Soto-school of tomorrow. Just in terms of numbers If they were to pay the same tax percentages for their oil exploration in Denmark to the Danish government as private companies have to pay to the Norwegian government, that would amount to 6 Billion Euros more in tax income from today until 2045. But the queen, and the Danish minister of education thank them so much for giving 70 million! When I first wrote this, I wasn’t aware of several points that appear in the final version. That is because the first ten people signing it had a say in the contents of it, and several of them added things I didn’t have a clue of. Arnold Peter Møller -- weapon producer for the Nazis -- is now being honored with a school named after him. The reaction in the borderland has been like it would be anywhere in Soviet Eastern Europe before the fall of the Berlin Wall: the newspaper Flensborg Avis refused to print it with the argument that the fond paying for the school had been “giving a lot of money to Southern Schleswig in the last couple of years”. Other people employed by the Danish institutions either were told that they could not sign such a thing or they were afraid of signing it due to past reaction from the system. The text was allegedly also spread in the intranet of the teachers down there. One guy went as far as calling me six times on my Nicaraguan cell phone and some 20-30 people sent me hate mails of various kinds. A reporter from Flensborg Avis went on and on in Facebook forums, trying to find some or other problem with the text. Unfortunately for him, he just revealed thereby that his investigative skills weren’t all that developed. 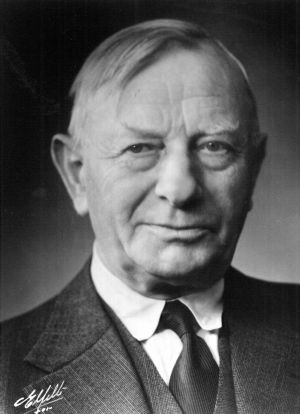 Remove A. P. Møller’s name from the Danish school in Schleswig! 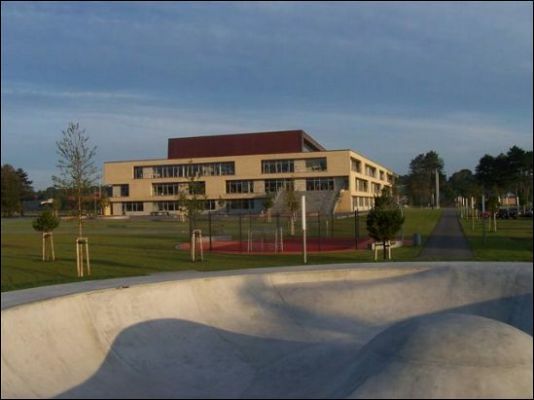 The area of Southern Schleswig, situated just south of the German-Danish border in German territory, recently received a second Danish high school in the city of Schleswig, sponsored by A.P. Møller, who is known for his MAERSK company. The school was named the “A.P. Møller School”. In the months before the official opening, the phenomenal building was admired not just by people associated with the Danish school and association system, but also of those inhabitants who only a day to take advantage of the German institutions in the region. The opening was visited by the Queen of Denmark, and in Arnold Mærsk McKinney Møller’s speech, we were made aware of the role of the private sector in building up the Danish institutions south of the border. And he was right with that: The private sector pumped well some money into the failed attempts to get a Danish majority in the area before a vote on the borderline in 1920 and financed the expansion of the Danish institutions southward in the post-war years. Axel Johnsons research in A.P. Møller’s financial support and semimilitaristic push towards the south until 1969 — against the Danish governments’ official policy — is a frightening proof of what ulterior motives were — and are? — behind that kind of “support”. During the second world war A.P.Møller had less problems with Germany. As the biggest stockholder in the company Riffelsyndikatet, the family produced weapons for the Nazis — and tried to get London to stop any attempts of sabotage. But where does the money come from today? MAERSK is a global company with revenue producing activities in many countries. Just between 2003 and 2004 MAERSK’s trade with the Pentagon grew in connection with logistical tasks between the U.S. and Iraq from just 239 to 639 Billion U.S. dollars. And while MAERSK in South Schleswig behave as benefactor, its role is slightly different in countries such as El Salvador. An example from Counterpunch.orgs newsletter from the 3rd December 2004: In 2001, MAERSK fired and black-listed 100 company drivers as part of a union busting strategy. Three years later, in 2004, trade union activist José Gilberto Soto from the International Brotherhood of Teamsters, who was visiting the country to try to establish contact with port workers, was shot by two armed men outside his mother’s house. Soto had worked in New Jersey to investigate MAERSK’s violations of labor rights for several years prior to that. MAERSK spokesperson claimed that they did not know about Soto, and trade union activists have since protested against the so-called “independent investigation” into Sotos death, that MAERSK started in cooperation with the government, because they believe it diverts attention from the true facts. MAERSK controls 80% of the container market in El Salvador, and it is clear that if the workers there would have paid a higher salary, then MAERSK’s profit share would diminish. There would probably still be enough left over to give away an opera and a super expensive school every now and then. But it could be interesting for the students to know what kind of activities the money for building their school originated from. Regardless of whether MAERSK was directly involved in the murder or not, we believe it is people like Soto who are the true heroes that improve the living confitions of the world’s poor — and not the large corporations who earn good at exploiting the disadvantaged. That is still true, even if such companies give parts of their profits to some charity or another. Now that the queen is back in the Kingdom of Denmark, the school is built, and one really has been everything one wants from A.P. Møller, it could perhaps be appropriate to show a sign. For this purpose, we propose to rename the A.P. Møller School. An appropriate name could be the “Gilberto Soto School”. Fjern A. P. Møllers navn fra skolen i Slesvig! Sydslesvig har fået et andet og nyt dansk gymnasium. I månedsvis før den officielle åbning blev det fænomenale byg beundret. Ikke bare af folk tilknyttet det danske skole- og foreningssystem, men også af de beboere, som til dagligt kun benytter sig af de tyske institutioner i landsdelen. Under åbningen var endda dronningen på besøg, og i Arnold Mærsk McKinney Møllers tale blev vi gjort opmærksomme på det private erhvervslivs rolle i at bygge de danske institutioner syd for grænsen op. Det private pumpede en del penge ind i det mislykkede forsøg på at få dansk flertal i Zone II under afstemningen 1920 og sørgede specielt for en ekspansion mod syd i efterkrigsårene. Axel Johnsons forskning i A.P. Møllers finansielle støtte og semimilitaristiske fremstød mod Ejderen frem til 1969 ? imod de danske regeringers officielle politik ? er et skræmmende bevis på hvilke bagtanker der lå (og ligger?) bag den slags “støtte”. Under anden verdenskrig havde A.P. Møller derimod mindre problemer med Tyskland. Som største delaktionaer i Riffelsyndikatet producerede familien våben til nazisterne — og prøvede at klage til London da produktionen blev udsat for sabotage. Men hvor kommer de penge egentlig fra idag? MAERSK er et globalt firma med indtægtsgivende aktiviteter i mange lande. Alene mellem 2003 og 2004 voksede Mærsks handel med Pentagon i forbindelse med logistikopgaver mellem USA og Irak fra godt 239 til 639 mia. dollars. Og mens MAERSK i Sydslesvig opfører sig som velgører, så er det lidt anderledes i land som f.eks. El Salvador. Et eksempel som vi kender til fra Counterpunch.orgs nyhedsbrev fra 3. december 2004: I 2001 fyrede og sort-listede selskabet 100 chaufførerer i et forsøg på at ødelægge fagforeningens organiseringsaktiviteter. Tre år senere, i 2004, blev fagforeningsaktivisten José Gilberto Soto fra International Brotherhood of Teamsters, som var på besøg i landet for at prøve at oprette kontakten med havnearbejdere i El Salvador, skudt af to væbnede mænd udenfor sin mors hus. Soto havde da arbejdet i New Jersey med at opklare MAERSK’s overtrædelser af arbejdsrettigheder i flere år. MAERSKs talsperson hævdede at de ikke kendte til Soto, og fagforeningsaktivister har siden protesteret mod den den såkaldte “uafhængige undersøgelse” i Sotos død som MAERSK startede i samarbejde med regeringen, fordi de mener den afleder opmærksomheden fra de sande fakta. MAERSK kontrollerer 80% af containermarkedet i El Salvador, og det er klart, at hvis arbejderne dér skulle få betalt en højere løn, så vil MAERSKs profitandel gå ned. Der ville vel alligevel være nok tilovers til at kunne forære en opera og en skole i mega-klassen i ny og næ, men det kunne jo være interessant for skolens elever at vide, hvilken slags aktiviteter pengene til skolebygningen oprindeligt kom fra. Uafhængigt af, om MAERSK selv var direkte involveret i mordet eller ej, mener vi, at det er personer som Soto, som er de sande helte, der forbedrer verdens fattiges livsbetingelser – og ikke de storkoncerner, som tjener godt på at udnytte de svagt stillede. Også selv om koncernerne så af og til giver noget af deres overskud til den ene aller anden velgørenhed. Nu hvor dronningen er tilbage i kongeriget, skolen er bygget og man egentlig har fået alt det man vil fra A.P. Møller, kunne det måske være passende at vise et tegn. Til det formål vil vi foreslå at man omdøber A. P. Møller Skolen. Et passende navn kunne være “Gilberto Soto Skolen”. Trykket i Dagbladet Arbejderen og Nordjyske. Entfernt den Namen A.P. Møller’s von der dänischen Schule in Schleswig! Süd-Schleswig, das Gebiet südlich der deutsch-dänischen Grenze, erhielt vor kurzem ein zweites dänisches Gymnasium. Es liegt in der Stadt Schleswig und ist gesponsert von A.P. Møller, der für sein MAERSK Unternehmen bekannt ist. Die Schule trägt den Namen “A. P. Møller-Schule”. In den Monaten vor der offiziellen Eröffnung wurde das eindrucksvolle Gebäude nicht nur von Menschen bewundert, die mit dem dänischen Schulwesen und Vereinsleben verbunden sind, sondern auch von Bewohnern, die nur die deutschen Institutionen in der Region in Anspruch nehmen. Der Eröffnung wohnte die Königin von Dänemark bei, und in der Rede von Arnold Mærsk McKinney Møller wurde dem Publikum die wichtige Rolle des privaten Sektors beim Aufbau der dänischen Institutionen südlich der Grenze erklärt. Der private Sektor pumpte Geld in den gescheiterten Versuch, eine dänische Mehrheit in der Region vor der Abstimmung von 1920 um den Grenzverlauf zu erreichen, und sorgte dann in den Nachkriegsjahren für die Expansion nach Süden. Axel Johnsons Forschung über A.P. Møllers finanzielle Unterstützung und semimilitaristischen Schub in Richtung Süden bis 1969 — gegen die offizielle Politik der dänischen Regierungen — ist ein erschreckender Beweis dafür, welche Hintergedanken es da gab (und gibt?) bei dieser Art von “Unterstützung”. Während des zweiten Weltkriegs hatte A.P.Møller hingegen weniger Probleme mit Deutschland. Als größter Einzelaktionär der Firma Riffelsyndikatet produzierte die Familie Waffen für die Nazis — und versuchte, sich in London über die Sabotageversuche zu beklagen, die die Produktion stoppen sollten. Und woher kommt das Geld heute? MAERSK ist ein globales Unternehmen mit Einnahmequellen in vielen Ländern. Allein zwischen 2003 und 2004 wuchs MAERSKs Handel mit dem Pentagon im Zusammenhang mit logistischen Aufgaben zwischen den USA und dem Irak von 239 auf 639 Milliarden US-Dollar. Und während MAERSK sich in Süd-Schleswig als Wohltäter verhält, ist die Rolle des Konzerns eine andere in Ländern wie El Salvador. Ein Beispiel, das im Counterpunch.orgs Newsletter vom 3. Dezember 2004 genannt ist: 2001 feuerte MAERSK 100 Fahrer als Teil einer Anti-Gewerkschaftsstragie. Drei Jahre später, im Jahre 2004, wurde der Gewerkschaftsaktivist José Gilberto Soto von der International Brotherhood of Teamsters bei einem gewerkschaftsorientertem Besuch des Landes, bei dem er Kontakt mit den Hafenarbeitnehmer aufnehmen wollte, von zwei bewaffneten Männern vor dem Haus seiner Mutter erschossen. Soto hatte zuvor in New Jersey mehrere Jahre lang daran gearbeitet, MAERSKs Verletzungen des Arbeitsrechts anzuprangern und aufzuklären. MAERSKs Sprecher kommentierte nach dem Tode, sie kennten Soto nicht. Seitdem haben gewerkschaftliche Aktivisten gegen die so genannte “unabhängige Untersuchung” von Sotos Tod, die MAERSK in Zusammenarbeit mit der Regierung startete, protestiert, denn sie glauben, dass diese nur von den wahren Geschehnissen ablenkt. MAERSK kontrolliert 80% des Container-Marktes in El Salvador, und es ist klar dass MAERSKs Gewinnüberschuss verringert würde, wenn die Firma ihren Arbeitnehmern dort mehr Lohn zahlen würden. Trotzdem wäre wahrscheinlich immer noch genug dafür übrig, die eine oder andere Oper und Schule in der Megaklasse zu verschenken. Aber es könnte für die Schüler der Schule in Schleswig interessant sein zu wissen, von welcher Art von Aktivitäten das Geld für den Aufbau ihrer Schule ursprünglich kam. Egal ob MAERSK direkt am Mord beteiligt war oder nicht, meinen wir dass es Menschen wie Soto sind, die die wahren Helden sind, die die Lebensbedingungen der Armen der Welt verbessern ? und nicht die großen Konzerne, die an der Ausnutzung der Unterdrückten verdienen. Das gilt auch, wenn diese Unternehmen einen Teil ihres Überschusses für wohltätige Zwecke weggeben. Jetzt, da die Königin ins Königreich Dänemark zurückgekehrt ist, die Schule gebaut ist, und man alles hat, was man von A.P. Møller wollte, wäre es angebracht ein Zeichen zu setzen. Zu diesem Zweck schlagen wir vor, die A.P. Møller-Schule umzubenennen. Ein passender Name könnte der Name “Gilberto Soto-Schule” sein. En la región alemana Schleswig del Sur, situada en la frontera con Dinamarca, fue construida hace poco la segunda escuela de secundaria danesa en la ciudad de Schleswig, patrocinada por el fondo de AP Møller, quien es conocido por su empresa MAERSK. La escuela fue nombrada “Escuela de A. P. Møller”. En los meses anteriores a la apertura oficial, el enorme edificio fue admirado no sólo por personas vinculadas con escuelas y el sistema de asociaciones danesas, sino también por aquellos habitantes que normalmente sólo usan las instituciones alemanas en la región. La apertura fue visitada por la Reina de Dinamarca y en la charla dada por Arnold Mærsk McKinney Møller, destacó el papel del sector privado en la creación de las instituciones danesas en el sur de la frontera. Y tenía razón: el sector privado financió muchos de los fallidos intentos de obtener una mayoría danesa en la zona durante una votación sobre la línea de la frontera en 1920 y también financió gran parte de la expansión del sistema danés hacia el sur en los años de la posguerra. Las investigaciones de Axel Johnsons sobre el apoyo financiero de A.P.Møller y su empuje semimilitarístico hacia el sur hasta el 1969 – contra las líneas políticas oficiales de los gobiernos daneses – es una aterradora prueba de lo que fueron las segundas intenciones (¿y posiblemente todavía son?) con ese tipo de “apoyo”. En los años de la segunda guerra mundial, a A.P.Møller le gustaba Alemania mas. Como dueño de 31.6% de los acciones de la empresa Riffelsyndikatet, la familia produjo armas para los Nazis — y trató de contactar a Londres para poner fin al sabotaje de la producción. Pero, ¿de dónde viene este dinero realmenten ahora? MAERSK es una compañía global con actividades que producen ingresos en muchos países. Sólo entre 2003 y 2004 el comercio entre MAERSK y el Pentágono creció, gracias a operaciones de logística entre los EE.UU. e Iraq, de 239 a 639 mil millones de dólares. Mientras que MAERSK en Schleswig del Sur se comporta como benefactor, su función es ligeramente diferente en países como El Salvador. Un ejemplo del boletín de Counterpunch.orgs del 3 de diciembre de 2004: En 2001, Maersk dispidió y puso en una lista negra a 100 conductores de la empresa como parte de una estrategia contra el sindicalismo. Tres años más tarde, en 2004, el activista sindical José Gilberto Soto de la International Brotherhood of Teamsters, que se encontraba de visita en el país para tratar de establecer contacto con los trabajadores portuarios, fue baleado por dos hombres armados fuera de la vivienda de su madre. Soto había trabajado en Nueva Jersey para investigar las violaciones de los derechos laborales de MAERSK durante unos años antes de la tragedia. El portavoz de MAERSK declaró que no conocía a Soto, y los activistas sindicales protestaron contra la “investigación independiente” de la muerte de Soto, que Maersk hizo en cooperación con el gobierno, porqué creen que desvía la atención de los verdaderos hechos. MAERSK controla el 80% del mercado de contenedores en El Salvador, y es evidente que si hubieran pagado un salario más alto a los trabajadores, el porcentaje de ganancia de MAERSK hubiera disminuido. Es probable que todavía tuvieran suficientes fondos para continuar financiando óperas y escuelas super caras. Tiene que ser interesante para los estudiantes saber de qué tipos de actividades provienen los fondos que han financiado la construcción de su escuela. Independiente de si MAERSK está directamente involucrada en el asesinato o no, creemos que es la gente como Soto, que son los verdaderos héroes, los que mejoran las condicionse de la vida de los pobres del mundo – y no las grandes empresas, aquéllas que ganan dinero en la explotación de los desfavorecidos. Eso sigue siendo cierto, incluso si estas empresas dan parte de sus beneficios a la caridad de algún tipo. Ahora que la Reina ya regresó a su Reino de Dinamarca, la escuela ya fue construida, y el pueblo ya ha obtenido lo que quería de AP Møller, es el momento para denunciar el hecho con una señal. Por eso proponemos que cambien el nombre de la Escuela A.P. Møller. Un nombre apropiado podría ser la “Escuela de Gilberto Soto”.